Psst...want to win some free clothes in the form of vouchers? OK, there are two ways you can do it. First, for £300, get over to the Burtons Facebook page and upload some pictures of yourself wearing as much denim as you can. They will pick a winner in the middle of the month and that winner will receive £300 in vouchers to spend in Topshop, Dorothy Perkins, Wallis, BHS, Evans, Topman, Outfit, Miss Selfridge - any of the Arcadia Group. Better still, I have a £50 e-voucher to spend with the same group to give away. All you have to do is to leave a comment between now and 9am one week from today (so that's 9am, 7 March) about your worst style mistake. Sartorial errors you've made over the years, clothes you wish you hadn't worn - email a pic to Guy@Clapperton.co.uk if you like and I might publish a few. No fee to enter, my decision is final and this is separate from the Burtons' Facebook page promotion, you can enter one, neither or both, and it won't affect any likely outcome. It's nearly time for the Oscars and last week we had the Baftas (we don't count the Brits because very few people are formal there). But what errors do blokes make when it comes to smartest bib and tucker? My thanks to Mytuxedo.co.uk for offering these six tips. The wedding of the year has arrived. The dress attire is morning suits. This consists of a jacket with tails, and striped formal trousers, a dress shirt and a dove or beige waistcoat should be worn. MyTuxedo.co.uk is finding, however that many men are hesitant about stripy trousers. While it may not necessary be your cup of tea, morning suits traditionally always require striped trousers and not adhering to this dress code would definitely ensure that you look ridiculous on the day. For every man that thinks it is a wise decision to wear a pleated shirt with a waistcoat, please don’t! The combination off too much pattern and material in the chest area is too much and is not a wise choice if you want to make an excellent impression on other people. It is not okay to wear a coloured waistcoat with a white dinner jacket either. It makes too much of a statement and when it comes to formalwear, you want to look suave and subtle to make the right impression. Traditionally with a white dinner jacket, wear a white Marcella waistcoat, a white bow tie and black trousers. Dress shirts can also cause confusion with many people as well they are not aware that they need to be a looser fit then a normal shirt. This is for allowing you to tie the button at the top. So before you decide to return the loose fitting shirt for a smaller size, take this into consideration and if you are still unsure, opt for a slim fit dress shirt instead. One rule that should always be considered when it comes to formalwear is patent dress shoes. Of course, you will realise that trainers are a definite no but so are ordinary black shoes. 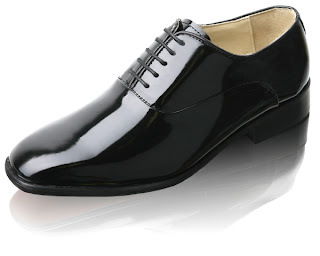 If you have a specific formal wear dress code to adhere to, then you must wear shiny patent shoes as well. On the day, make sure they are nicely shined and buffed and do not have any scruff marks. This final touch will ensure that you look your very best on the day. This guide will hopefully ensure that you look great at any formal event but just in case you need any more style advice, then visit MyTuxedo.co.uk for great tips and excellent formalwear 50% cheaper than the high street! I think we can allow them the plug at the end - useful stuff, my thanks once more. I had a note from Apple's (no doubt) sales and marketing department the other week, telling me to buy my loved one an iPad Mini. If she wants to get me one then fine, although I'd query the expenditure when there are rooms in the house that need repairs and money spent on them. Tokens it is for us, and they might well include a new scent. I've recently been testing a box set of Storm Electric, courtesy of the people from BrandAlley; it's pretty good, although I do have an issue with the name. I'd never have asked for anything called 'electric', I'd have assumed it was to do with electric shavers. It's not. The shower gel and eau de toilette in this package is woody with traces of cinnamon and lemons and lasts a fair time. There's a bit of citrus in there as well. Oddly for a spicy number my wife rather liked it - usually she goes for naturals. I'd be happy with a bottle of this for my valentine's present any year; that said, I've already got one now. So, iPads all round then..?